Posted by themotochanneladmin & filed under Motorcycle Kick Starts. 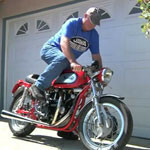 Hokan Martensson of Costa Mesa, California demonstrates how he kick starts his custom 1947 Harley-Davidson FL Knucklehead Bobber. 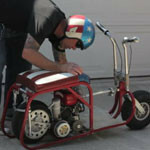 Hokan Martensson of Costa Mesa, California demonstrates how he kick starts his custom 1956 Harley-Davidson FLE Panhead Chopper. 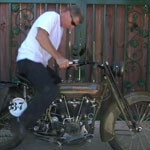 Tom McBride of Long Beach, California demonstrates how he kick starts his 1922 Harley-Davidson model J, which he plans to ride in the 2012 Motorcycle Cannonball Endurance Run. 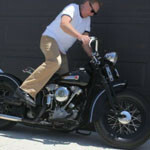 Larry Horn of Huntington Beach, California demonstrates how he kick starts his Norvin. 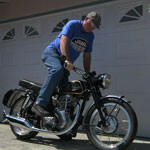 Larry Horn of Huntington Beach, California demonstrates how he kick starts his 1955 Velocette MSS. 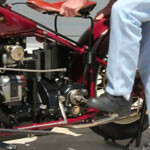 Ed Mitzner of Westminster, California demonstrates how he kick starts his 1929 Henderson KJ. 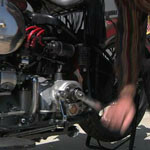 Steve Mitzner of Lakewood, California demonstrates how he kick starts his 1938 Indian Four. Jim Bradford of Costa Mesa, California shows us how he assembles his 1960 Centaur folding scooter. Shawn McClelland of Huntington Beach, California shows us how he assembles his 1964 Fuji Motor Go Devil folding minibike. 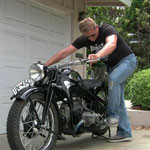 Tony Messenger of Manhattan Beach, California demonstrates how he kick starts his beautifully restored 1941 Zundapp KS600.